Georgian Mews Guest Accommodation - Room OnlyNewly built luxury accommodation in a quiet backwater right in the city centre. Built in 2013, this lovely accommodation has hotel quality rooms at guesthouse prices. Breakfast, if required, can be taken in Georgian Guest House or in your room. All rooms have a pull out bed for children. Newly built luxury accommodation in a quiet backwater right in the city centre. Parking is available in the nearby public car park - costing £7.00 a day. Permits for this are available from our Reception. Children welcome from any age. Georgian Mews sometimes limits bookings to 3 or more days. These rooms are equipped to a higher level, with contemporary hotel quality furniture, luxurious wool carpets and travertine tiled shower rooms with crisp white pottery. 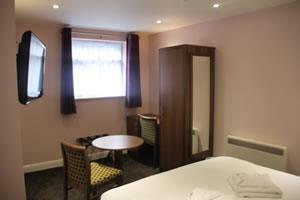 Rooms also include free wi-fi, hospitality tray, colour television and hair dryer. Superior double sometimes limits bookings to 3 or more days. Coming into York on the A19 ffrom Thirsk, Georgian House and Mews can be found on the left 2.2 miles from the outer ring road just 100 yards from the city walls. Building is not suitable for wheelchair users but guests with limited mobility should have no problem with ground floor rooms.